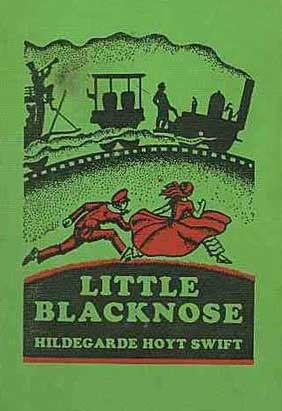 Little Blacknose: The Story of a Pioneer by Hildegarde Hoyt Swift is another book you will have to track down. I suggest starting at your local library. The story of the first steam locomotive to operate in New York, the DeWitt Clinton locomotive. This 1930 Newbery Honor book introduces children to trains, via the DeWitt Clinton locomotive, and provides a brief history of the railroad. This story is too long to be read in one go and is divided into chapters, which allows this book to be read a chapter a day/week, and provides an opportunity to open nonfiction books about trains. I've read this book twice now. My family introduced me to the goal of reading all the Newbery books when I was young; my kin had to track down a copy of this book and this took a few years. I was too old for when I first encountered this book and the sing-song quality of the prose irritated twelve-year old me. I imagine the prose could appeal to a younger audience (ages 4-7), especially to one interested in trains, but it lacks adult appeal. The anthropomorphizing of trains and animals allows the author to work in emotions that young children are just starting to recognize, addressing issues like competition/bullying. Ethics have changed since this book was first published so the responses might not suit modern parents; parents/caregivers should read this book before sharing with their kids (book can be set aside and used to open discussion regarding what parents/caregivers think is a better response to the situation). As an adult reader, I continued to dislike the sing-song prose. It encourages repetition and pads the story with unnecessary words, while avoiding the opportunity to introduce kids to new vocabulary. Like I said, younger audiences probably won't mind but it wears down older readers.